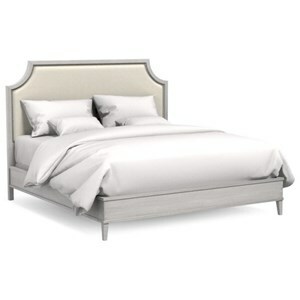 A bed with a less is more sensibility, the Monroe bed plays a supporting role in your grand design. The coved shaped corners of the headboard speak to tradition, while the tapered legs and clean footboard play towards a more contemporary vibe. It really is the epitome of transitional. 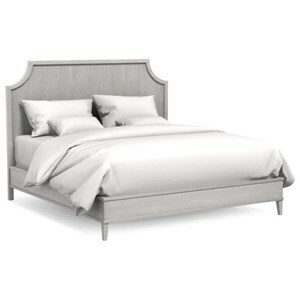 Pair this bed with Wardley, Lee, Charlotte, Jordan, Armstrong and Annabel storage pieces. The Monroe bed is available with a wood headboard or select from any Artiste performance fabric and nailhead trim option for a bed with an upholstered headboard. The Monroe Customizable California King Wood Bed by Artiste Furniture at Home Collections Furniture in the Denver, Aurora, Parker, Highlands Ranch, Castle Rock, CO area. Product availability may vary. Contact us for the most current availability on this product. Finish Custom finish options. Full finish around the whole case. Hand finishing and aging techniques to complete your furniture. Greenguard Gold certified for low chemical air emissions. Browse other items in the Monroe collection from Home Collections Furniture in the Denver, Aurora, Parker, Highlands Ranch, Castle Rock, CO area.